For over 30 years trusted pastor and teacher John MacArthur has delivered practical Biblical insights for helping Christians grow in their own journey of faith. Now David C Cook is offering the very best of John MacArthur's Christian living titles in a repackaged and revised format. Based on the timeless originals these new editions feature a fresh look and study guides for both personal and group reflection all centered on topics and issues that matter most to believers. We all know that spending time with God is essential to an intimate growing relationship with Him. Yet many of us struggle to make prayer a consistent dedicated part of our daily lives. Alone With God offers powerful encouragement for anyone longing for a deeper richer time of prayer. Here John MacArthur turns to the perfect mentor on prayer Jesus Christ as he explores the profound insights found in the Lord's Prayer. Alone With God by John Macarthur was published by David C Cook in April 2015 and is our 34699th best seller. 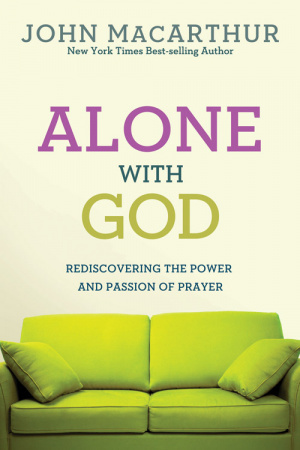 The ISBN for Alone With God is 9780781405867. Be the first to review Alone With God! Got a question? No problem! Just click here to ask us about Alone With God.